We love the look of this concept drawing by Oppenheim Architecture + Design for a new desert resort at Wadi Rum in Jordan. With 47 desert lodges carved into sandstone cliffs or spanning the desert like a glass curtain, this place looks as if it will be amazing. The Luxury Travel Bible is so impressed, we want to book in now! 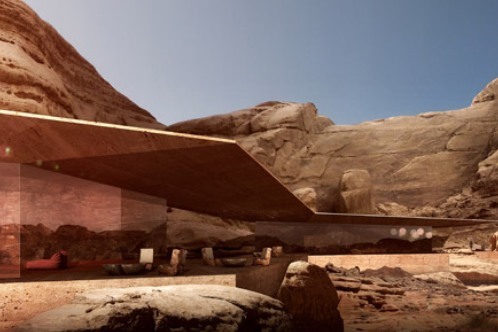 Miami based Oppenheim Architecture + Design are the creators, and they say the design 'set out to reinterpret the way society deals with surrounding nature by taking full advantage of the mystical valley where desert sand meets desert stone'. It certainly seems to do that, merging with its surroundings while being equally dramatic. There is plenty of luxury here too, but Oppenheim say the opulence 'is intentionally reduced to what is essential'. There is sustainability too; cross ventilation and shading takes advantage of the natural cooling effect of the rocks, water is re-harvested, and thermal mass heating will ensure desert guests are able to relax in comfort. The resort is scheduled to open in 2014. "We have trained and heightened our senses to see, smell, taste, hear, and touch the mystical beauty of Wadi Rum. We tapped the inherent power of the desert through primal and instinctual design moves, informed by the forces, rhythms and patterns of nature-- past, present, and future," says founding principal Chad Oppenheim about his creative process for the project. We don't know about that, but it looks pretty special to us.